Using the results as a basis for assessment, it is clear that the electoral contest has been won and lost. President Muhammadu Buhari of the All Progressives Congress (APC) polled more votes than his other challengers from 72 other political parties to retain the ultimate prize in Nigerian politics for a second term of four years. Although former Vice President Atiku Abubakar, Buhari's main challenger, who ran on the platform of Peoples Democratic Party (PDP), is kicking against the verdict, the declared winner would continue to bask in the euphoria of victory, at least for now. Another dimension of the participation of the fringe party candidates has to do with the disruptive ideas they introduced into the political space. What they lacked in deep pockets they made up for with savvy use of technology to organise their support base. Beyond using technology for the purpose of political organisation, fringe parties and their candidates made attempts to push the governance debate in a new direction reflecting the need for participation, inclusion and service delivery. Fringe parties' candidates, especially the younger elements on the ballot apparently wanted to defy the established political norms by registering their presence on the ballot. These candidates probably were keen to make the cut on the ballot to remind the electorate and the grand fathers in the political sphere, that across the world, the best political practice was for young men and women in their prime to aspire and realise their aspirations to lead their countries. 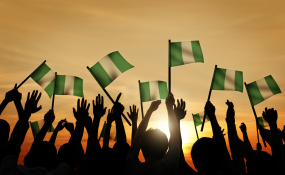 For the most therefore, the candidates who participated on the platform of the less known parties, tried to interrogate, and even challenge the major elements that have shaped Nigeria's political participation since the Second Republic. Those objectives, it could be argued, were largely met because the Nigerian people were presented with options. Even if the electorate has refused to choose now, they may as well reflect on the choices presented to them and eventually engage in a much more thoughtful process in future. However, it has to be conceded that the electorate would only respond to the calls for a paradigm shift, if the candidates were better able to understand the political dynamics and mobilise the electorate accordingly. MOGHALU of the Young Progressives Party (YPP) ran a strong campaign; despite being a fringe party candidate, he manage to stay in the limelight by constantly making the clarion call for a paradigm shift in Nigeria's politics. Those efforts do not appear to have yielded much response in the immediate, as the YPP flag bearer placed 14th in the result with 21,886 votes. This poor showing in the polls notwithstanding, Moghalu can take consolation in the belief that a time could come in the future when the electorate would warm up to the message for a paradigm shift in leadership and politics. However, the period between now and when the message eventually resonates with voters should be used to create structures and deepen engagements with Nigerians at the local level. In 2023, the national sentiment would be favouring the South East geo-political zone to produce Nigeria's President. If he builds a stronger and much more active political machine on the ground, should be in the mix. If he is truly interested in the top prize therefore, the real time for the hard work of building bridges and coalitions has just stared. Meanwhile, let's pray that Ifeanyi Ubah, the only YPP senator-elect from Anambra stays. His presence in Lagos for the governorship campaigns did not represent one who has staying power, in the event the authorities decide to make a bargain. With EFCC still very active, you never can tell. APART from a few billboards scattered across the country, and appearances at the debate podium, Durotoye's bid for the Presidency was a chastening reminder of the odds against those who aspire to take on the task of wresting the political space from the current power holders. Running on the platform of the Alliance for New Nigeria (AAN), Durotoye, like other fringe party candidates has learnt some valuable lessons, which could shape his political career. With 16,779 from across the country, Durotoye must now be aware that his political career has to unravel from humbler beginnings. Winning the Presidency of Nigeria is not a stroll in the park; the political terrain is far too complex for mere aspirations. Part of the push for the Presidency should include some learning of the ropes at much smaller levels of political competition. For the motivational speaker and leadership coach, some years with a seat at the National Assembly would be a good initiation to understanding the unstated ground rules of the Nigeria's complex political process.